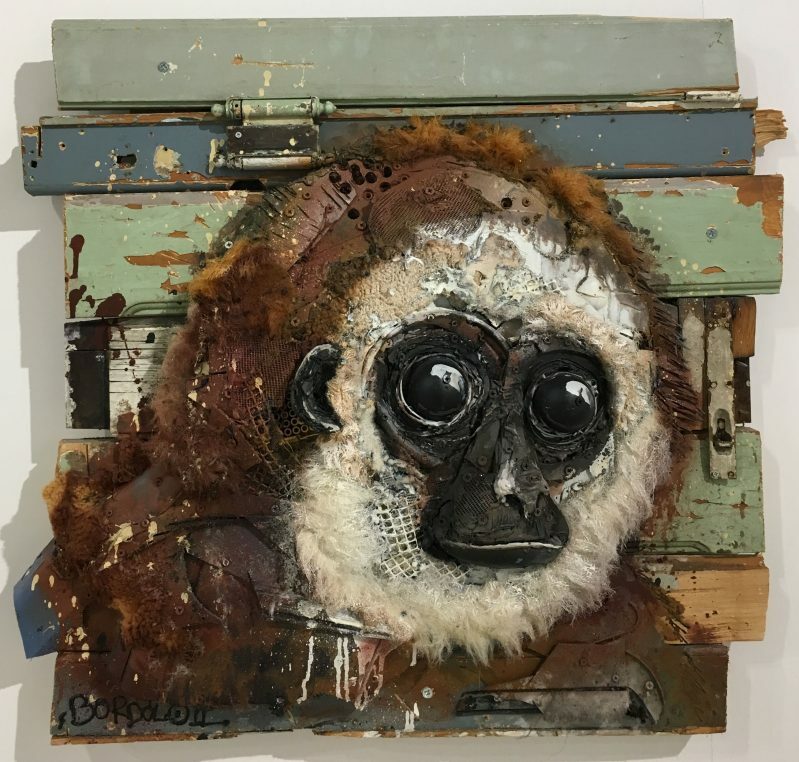 He is 31 and admits to having been a bad boy for a while but now, Bordalo II, the grandson of a Portuguese watercolorist with the same name (thus the II), is exhibiting his strange animals near the Grande Bibliothèque in an empty concrete space which will become a supermarket at the end of the year. 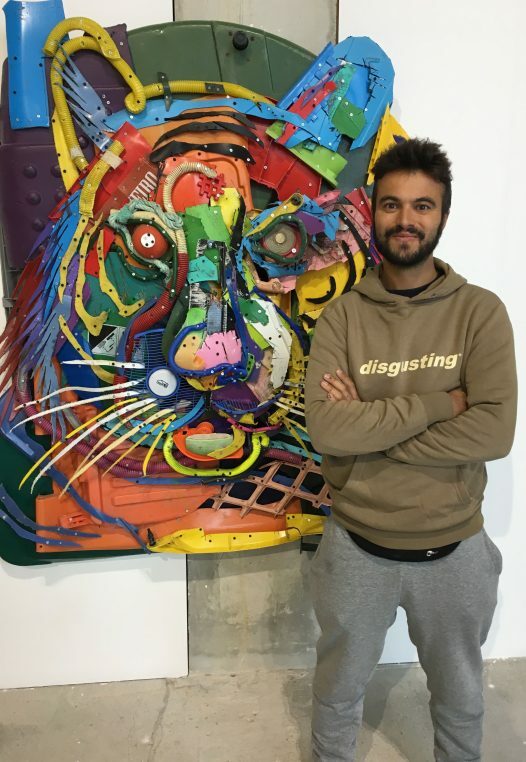 The irony is that he spends his life and his art fighting plastic waste and turning garbage into art. The title of the show “Accord de Paris” refers to the Cop 21 agreement signed by 55 countries with Laurent Fabius in November 2016. I completely fell for him and his bears, lions and elephants which will seduce more people than just children. 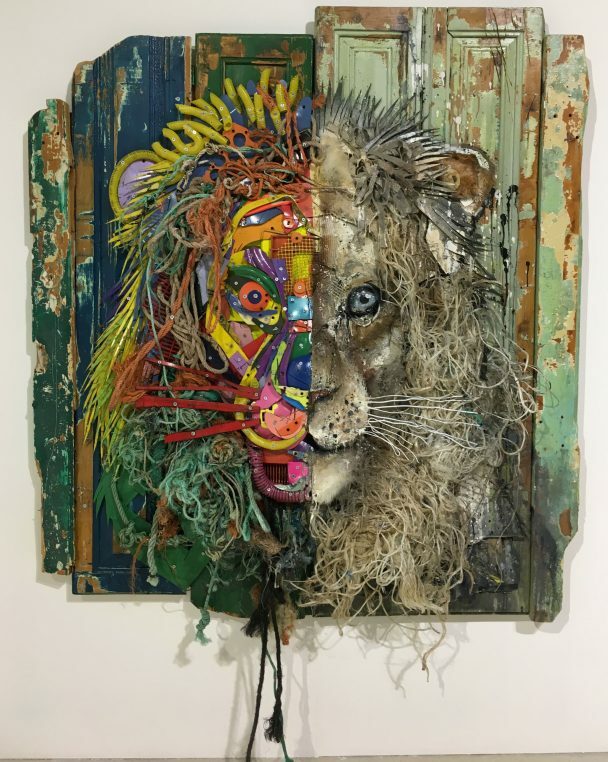 Born in 1987 and raised in Lisbon, Arthur Bordalo is a street artist. He is already known in Paris for a large rat he painted on Le Mur, rue Oberkampf in 2016 and a Beevor in 2017. He showed in San Francisco and in Madrid last year, in Dresden, Torino and Hamburg before. His “zoo” moves around public spaces and symbolizes his fight against mondialisation, waste and destruction. His sculptures and frescoes are made of the same material, plastic, iron, wool, pipes, that kills animals around the world. 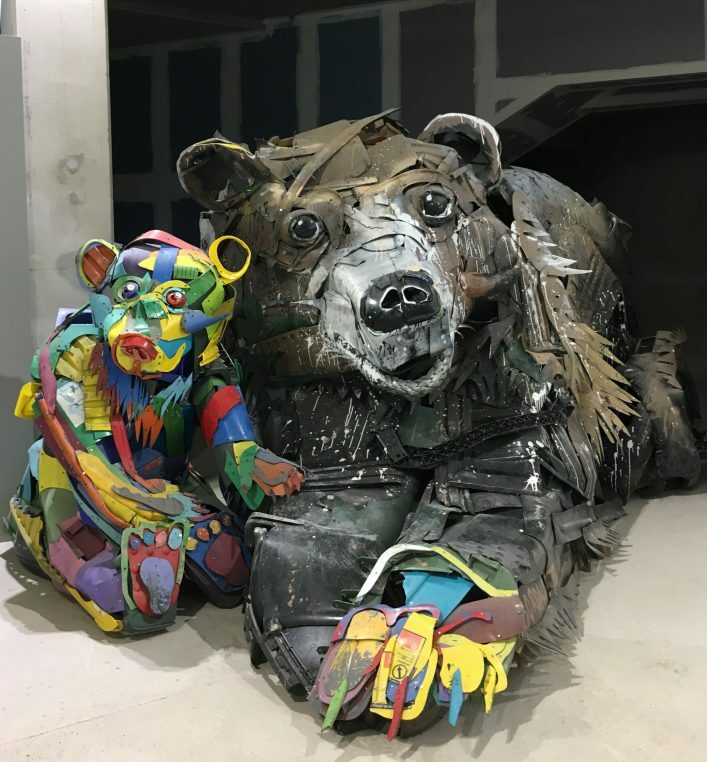 The 130 pieces he made so far with 42 tons of waste are now “living” in 23 countries and four continents. The intelligence and the charm that exude from this young man won me over as he was telling me about his team of four who follow him everywhere. His wife Mariana Duarte Silva is a lawyer and she came for the opening. His galerist, Mathilde Jourdain from Mathgoth gallery which specializes in graffiti artists, helped him climb on stage three years ago. She was also the clever mind who found this huge empty space for the 5 week long show (until March 2). Some of the sculptures were assembled on the spot, others came directly from Lisbon. The details are as fascinating as the finished sculpture and one can see the long drawing and painting training he went through in Art school, after his grand father, a watercolor artist, let him potter around with paint when he was a child. There will be tours organized for school children every morning and the show is free admittance and open every afternoon Tuesday to Sunday from 2pm to 7 pm. 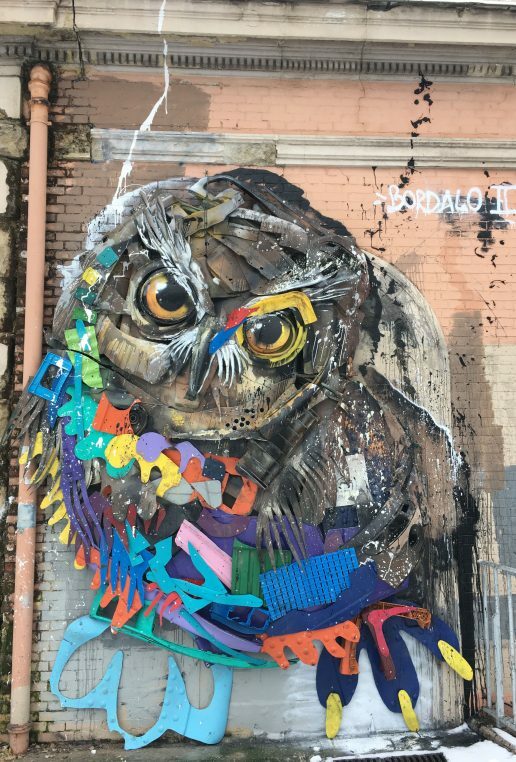 “Accord de Paris” by Bordalo II, 10-12 ave de France, 13. Until March 2. Génial, Laure ! Merci ! Quelle gaieté, quel humour, quel talent ! Lorsque l’humour rejoint l’art, nous montons au 8ème ciel !